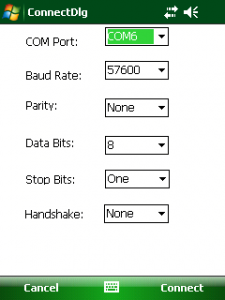 Here is a simple application to connect to a serial port. The idea is based on the need of having an application to send demo print files to a virtual comm port connected to a bluetooth printer. Update 16. March 2011: Added dialog to connect to BT printer by BT Address on Intermec devices. New source and binary at code.google.com. 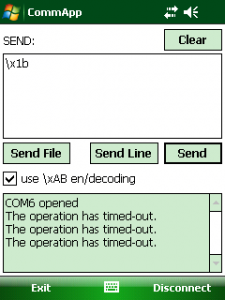 CommAppCFSerial does serial comm only. 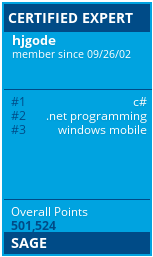 see code.google.com/p/win-mobile-code … Executables are in bin subdirs. You can enter and send texts to or send a whole file to the port. 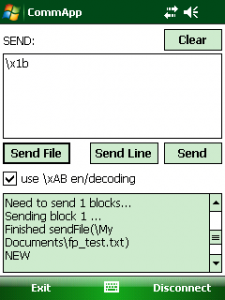 Additionally you are able to send ASCII codes by using \xAB syntax, where AB is the hex code of the byte you would like to send. There is nothing special with the code except the hex decoding/encoding and the possibility to send a file. it has been a long time since my last post, I was a little bit busy. This time I want to present some experimental code to visualize and analyze G-Sensor data. The goal was to achieve a shake detection algorithm. Unfortunately the device under test only provided 1 sample per second and that is not enough for a good shake detection. Beside that the code and classes developed may help you to find your way and they help you at last to determine the current orientation of the device. A g-sensor or accelerometer sensor normally gives you the x, y and z-values of a vector. A vector is an imaginary arrow with a direction and length starting from the three dimensional point 0,0,0. The vector direction points to the acceleration of the device. The normal acceleration on earth is 9,81m/s^2. If the device is on the desk, the y-acceleration is about minus 9.81m/s^2. The absolute value of the sensor may vary on the sensor and maybe defined as 1.0 for -9.81m/s^2 or -0.981. If you through the device up to the air, the x,y and z-values will reach 0,0,0 as if the device is weightless. Keep in mind that the acceleration towards the middle of the earth is always there and the device will come back to you. The device is facing upwards (see y arrow) with the top facing to you (the z arrow). The left side of the device is pointing to the right (the x arrow). The light green/blue and the yellow arrows demonstrate two different vectors which show the direction (the xyz angles) and the force (the vector lengths) to the device.